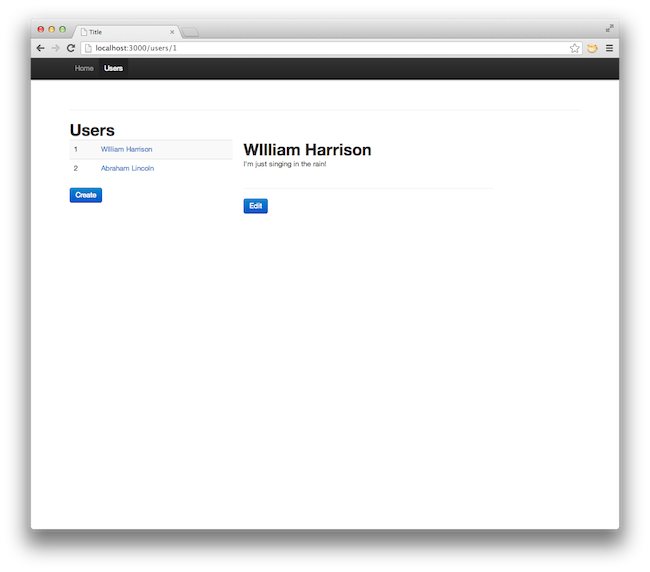 In Part 1 I showed you how to setup a Rails-API app for Ember. Now let’s build the app itself. In this part I will go over building the Ember app from the perspective of a Rails developer. I will be making comparisons to where Ember resembles common patterns in Rails and even Ruby itself. I know I promised a 2-part series but I’m going to extend this to 3-parts. This post was growing too large to cover everything. Otherwise your Ember templates won’t compile properly. This is the Ember equivalent of a Rails layout template. The outlet is the Ember equivalent to yield in Rails. So this template will wrap the other templates we plan on rendering. I will come back to the <li>s in the nav later. This will tell the Ember Router to use the History API instead of the default ‘hash’ URLs for routes. The mapping of the / in our app is implicit in Ember, and it will be assigned to a route of index. The Ember Router will use this string to make some assumptions. If there is a App.IndexController object it will use that controller. If not, it will just render out the index template. Now, under the hood Ember is still using a App.IndexController controller but it will define one on the fly. I will get into this in a future blog post. When you call reopen this is the Ember way to reopen and monkey patch a class. As you can see the Ember Router syntax is similar to the one in Rails. This is by design. We need the 2nd route there so our application.hbs template can compile as it is referencing the users.index route. Reload your app and you can click back and forth between ‘Users’ and ‘Home’, thanks to the linkTo actions we setup in application.hbs. These actions map to controllers being automatically generated because we haven’t created them yet; those controllers automatically render the templates with the same naming convention. Does that sound familiar? That’s right, its our good friend Convention Over Configuration! Each attribute is a function that will compare the currentRoute attribute to a value and return that boolean result. We instruct the attribute to be a computed property. Computed properties are simple to understand: we tell Ember to automatically update the value of ‘isHome’ when currentRoute is set to a different value. Ember will then instruct anything bound to that attribute to update as well. this.controllerFor When interacting with a specific controller you may want to modify a different controller. In this case the wrapping controller is ApplicationController and we need to update the currentRoute attribute. You must use the set function otherwise Ember won’t know to notify any computed property observers. Now reload your app and click between the actions and you should see the active states properly set depending upon your route. We are defining each attribute that is coming over the wire, as well as a computed property that will combine firstName and lastName. If you’re wondering about that call to property, you have to let Ember know when a method on an object is using a property computed from dependency properties on that object. Here fullName depends on firstName and lastName. When we call property and let Ember know which properties to observe, the fullName property will update if either the firstName or lastName changes. If you like, you can read more about computed properties. The App.User.find() makes a remote call, fetches the collection, and instantiates the models. This collection is then passed to setupController through the model attribute. We then assign this collection to the users attribute on the controller. We are linking to the show named route and passing the instance of a User (which is what this refers to) as the paramater. Ember will pull out the id on the object and set that to the :user_id segment on the path. Note how we are matching against :user_id and not :id that Rails developers are used to. I must confess I don’t entirely understand why the / map is necessary under /users, I would have thought the top nesting could be used and it wouldn’t be necessary to redefine a root path. Please enlighten me in the comments! Ok, the router maps are updated. Let’s add the show route. So we have only implemented the ‘Read’ of ‘CRUD’ in this part, but we have also introduced alot of new concepts. In Part 3 we will implement the ‘Create Update Destroy’ actions.